Vitiligo is a common, genetic, autoimmune skin disease in which there is loss of pigment from areas of the skin resulting in irregular white spots or patches. The skin has normal texture. 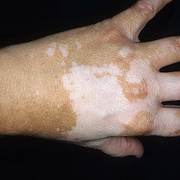 Vitiligo may appear at any age. Although it is a progressive condition, many people experience years or decades without developing new spots. Autoimmune disorders are characterized by the body's immune system attacking its own tissue or cells, in this case, the melanocytes (pigment cells which give the skin its color). Normally the immune system's white blood cells and antibodies help protect the body from harmful substances, called antigens, which may be derived from bacteria, viruses, toxins, or other sources. In an autoimmune disorder, the immune system mistakenly begins to attack healthy body tissue. Scientists are of the opinion that, in most people with autoimmune disease, the immune system is basically normal outside of the autoimmune attack. 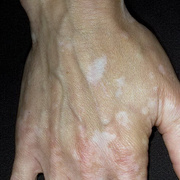 Thus, people with generalized vitiligo are thought to have otherwise healthy immune systems except for the specific immune response to melanocytes. Vitiligo is not contagious in any way. The precise cause of Vitiligo is not well-understood, though it seems to be the result of a combination of genetic, immunologic, biochemical and neurogenic factors. It is often, though not always, seen in families. Though the condition has no other known effects on the body, the psychological and social effects are well documented. Today, vitiligo is a treatable condition, though treatment can take two years or longer to regain pigment, and repigmentation may not be 100%. There is more research being conducted than ever before; in Europe, in Asia, and in the U.S., new technologies and research are changing physicians' approaches to the condition. The recent mapping of the human genome has paved the way for advanced genetic research into vitiligo, and other cell-based theories are also gaining attention. Many experts believe that with genetic and biomedical technology improving as they are, that within the next few years, we will see a greater understanding of vitiligo, as well as faster and more reliable treatments for this, and other autoimmune conditions.